When the Loudoun Symphony Orchestra opens for its 2018-2019 performance season at the end of September, its 65 musicians will be performing under the baton of Maestra Nancia D’Alimonte. Hailed as “highly relatable,” “passionate,” and “personable” the new conductor will now lead the orchestra following the death of Marc Allen McCoy in 2016. McCoy was credited with raising the ensemble to a new level of excellence during his 18-year tenure as music director and conductor. In an interview with Loudoun Now,D’Alimonte praised McCoy for his work with the LSO. Describing herself as an “orchestra builder,” she said McCoy had built a program with “really good bones” on which she can continue to build. D’Alimonte is also the conductor of the NIH Philharmonia, an 85-piece orchestra she founded 13 years ago. She was a guest conductor at the Messiah Sing-along at the Kennedy Center from 2009-2015. 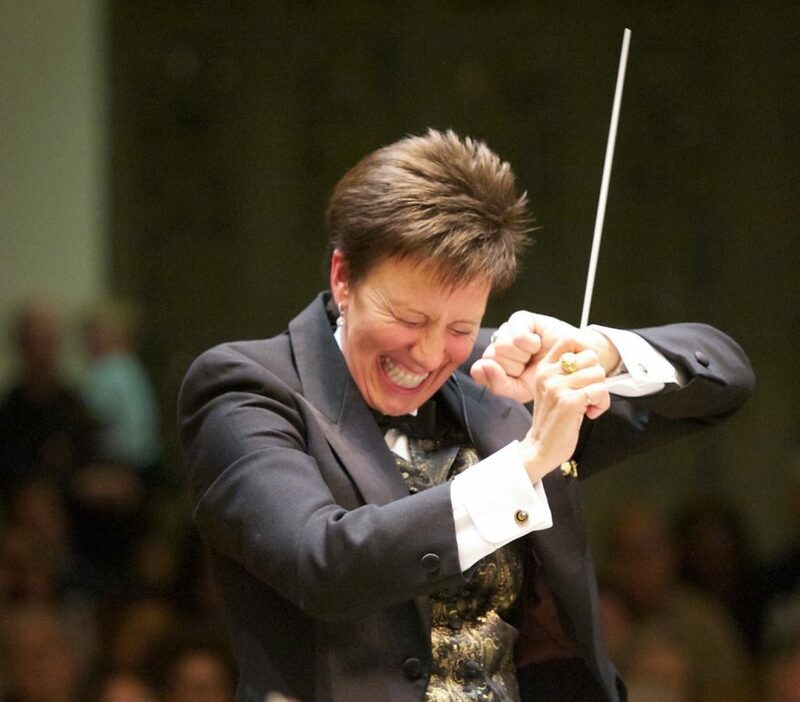 She holds a doctorate of musical arts in orchestral conducting from the Eastman School of Music in Rochester, NY. In the ways these things sometimes seem pre-ordained, D’Alimonte only heard of the LSO opening by happenstance. A longtime supporter of the orchestra called LSO Executive Director Karen Knobloch, telling her, “I have the perfect candidate.” After being contacted by the LSO, D’Alimonte was able to gather the necessary materials and submit her application just before the deadline. D’Alimonte seeks to draw the audience in, to immerse them in the music. Calling herself a teacher and a storyteller, she does so by making the music challenging, interesting and accessible—to the audience, to herself, and the musicians. “I bring energy and excitement. That’s what transcends to the audience,” D’Alimonte said. She also noted that conductors have to deal with the unexpected. Once while conducting a Mozart piece, someone’s cell phone went off. “I’ll call him back after the concert,” she quipped to the audience. “That’s life, you have to deal with it —and you do so by making it relatable,” she said. “Music should not be stuffy,” she insists. Nor she does pay any attention to the fact that she is the first female conductor of the orchestra, finding that gender has little to do with it. Attendees at the first LSO concert will find their new maestra wears the traditional conductor’s tails, but she will wear a skirt, not pants. It’s been a long search to find the right person to succeed McCoy. Seventy-four applications were received, which were then whittled down to three finalists—“all of whom were very good.” Those finalists were required to plan and conduct a concert before the public. “I liked the process. I got a better feel and understanding of the logistics from the conductor’s point of view,” he said, adding he learned how to build an audience and how to improve the organization’s outreach to sponsors. Knobloch credited LSO board member Raelene Wagoner, who had extensive human resources experience in a large company, with establishing a successful framework and schedule for the search. The initial committee evaluated the 74 submissions over several months, then ranked the top nine candidates, to be looked at in depth. Then members of a different committee interviewed the top three candidates—each of whom was asked to prepare two programs to perform to the public. Those repertoires were given from January through April and attendees were asked to fill out a survey giving their opinions—comments that were included in the final deliberations. D’Alimonte led the orchestra during a Nov. 4 performance at Broad Run High School. The orchestra’s musicians also were asked to review and comment on the concerts. The decision team—a small group including LSO President Michael Egan, four musicians and Knobloch—made the final choice. Principal bass Michael Rohrer is one of about five musicians who have been with the LSO from the beginning—having filled a number of positions, including executive director and treasurer. Now he takes care of the books and insurance matters. Rohrer was involved in the search process and called D’Alimonte “very personable, no nonsense and accessible.” He was impressed with the comments from the public, finding them “very thoughtful and analytical—they were very helpful.” He also noted that respondents had taken time to assess the future direction for the LSO. “She’s very inspiring, and demanding in a good way,” he said. And he was impressed that by the time of her first concert rehearsal last November that D’Alimonte had learned everyone’s names. “You respond better that way,” he said. D’Alimonte is fully in sync with the LSO’s long-held pursuit of a permanent performance venue. Currently, the LSO performs in county high schools. The LSO also has two youth groups, comprising about 70 performers. “We need a home,” she said. The LSO’s biggest challenge is that Loudoun has no arts center, apart from the Franklin Park Performing Arts Center in western Loudoun where the stage is too small for a full symphony. D’Alimonte is thinking of a larger venue of about 1,000 seats, she said. “We try to spread the word, as so many people said they don’t know how to find us,” Knobloch said. Now, with the excitement building for the LSO’s upcoming season under Maestra D’Alimonte, there is hope the time is ripe for a new push for a permanent home.